A native of Kern County, John is a graduate of San Diego State University. He has been in the insurance industry since 1973 and Partnered with Rolly Rhodes in 1993. In 2003 he became a Certified Work Comp Advisor. 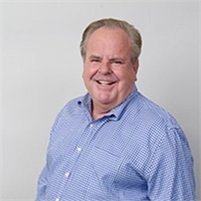 Over the years, John has been involved in many community organizations and is currently a member of Bakersfield West Rotary, Chamber of Commerce, and Downtown Business Association. He and his wife Sweet Sue are the proud parents of six boys and four grandchildren.